Mateus, the iconic Portuguese wine brand has launched its first app - Mateus Perfect Serve - letting users know when their bottle is perfectly ready to serve. 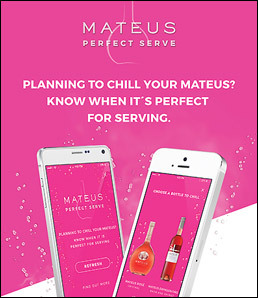 Available for download via their recently launched website: http://mateus-perfect-serve.mateusrose.com the App lets users know when their bottle of Mateus is at the correct temperature and perfect to serve. Users simply select the style of Mateus wine they are drinking, the approximate room temperature, where they are chilling the wine and then an alarm will go off when the wine is ready to serve. This is the latest initiative from brand leader Mateus following their summer campaign in the UK market which saw the Mateus “zone” appear at several summer food and drink festivals as well as a Mateus Rosé BBQ competition running across key UK retailers. These recent activities form part of a £1.5M investment by Mateus in the UK market this year alone. The launch of the new app will be supported via the new webpage alongside their social media channels. The app is available on both IOS and Android platforms.